Στην περιοχή Τζιμπάραν, το Kila Infinity8 Bali, inspired by Aerowisata Hotels αποτελεί ιδανικό σημείο για να εξερευνήσετε την πόλη Μπαλί και τα περίχωρα. Μόνο 10 km από το κέντρο της πόλης, η στρατηγική θέση του ξενοδοχείου διασφαλίζει ότι οι επισκέπτες θα έχουν γρήγορη και εύκολη πρόσβαση σε πολλά από τα τοπικά σημεία ενδιαφέροντος. Από τη βολική της τοποθεσία, η ιδιοκτησία προσφέρει εύκολη πρόσβαση σε κορυφαίους προορισμούς της πόλης. 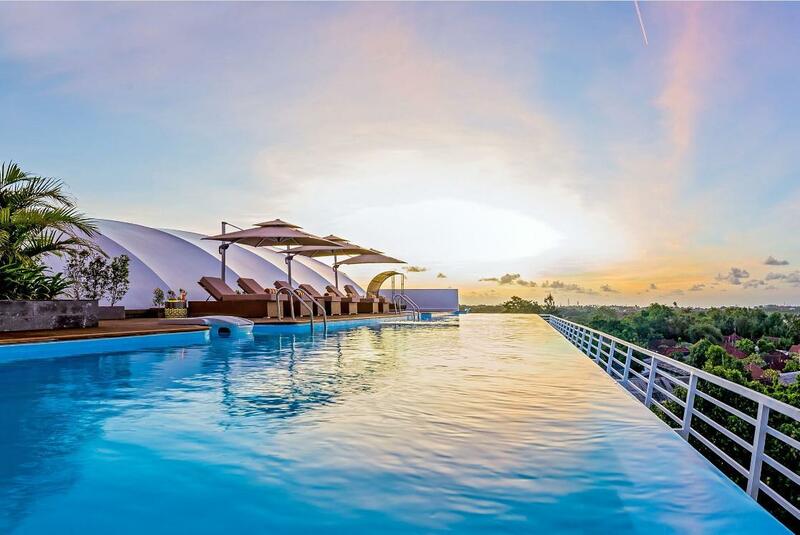 Το Kila Infinity8 Bali, inspired by Aerowisata Hotels προσφέρει άψογη εξυπηρέτηση και όλες τις βασικές ανέσεις στους ενθουσιώδεις ταξιδιώτες. Αυτό το ξενοδοχείο προσφέρει πολυάριθμες εγκαταστάσεις για να ικανοποιήσει ακόμα και τους πιο απαιτητικούς πελάτες του. Τα δωμάτια του ξενοδοχείου έχουν διαμορφωθεί προσεκτικά ώστε να παρέχουν υψηλό επίπεδο άνεσης και την ευκολίας. Σε κάποια από τα δωμάτια, οι επισκέπτες μπορούν να βρουν επίπεδη τηλεόραση, κρεμάστρα ρούχων, δωρεάν καφές φίλτρου, δωρεάν τσάι, δωρεάν ποτό καλωσορίσματος. Το ξενοδοχείο προσφέρει μια άριστη ποικιλία ψυχαγωγικών εγκαταστάσεων, όπως τα γυμναστήριο, εξωτερική πισίνα, σπα, μασάζ, παιδική πισίνα. Όταν ψάχνετε για ένα άνετο και βολικό μέρος για να μείνετε στη Μπαλί,το Kila Infinity8 Bali, inspired by Aerowisata Hotels γίνεται το σπίτι σας μακριά από το σπίτι σας. Children 3-11 years old will be charged 50 % of the adult price for breakfast when using existing bedding. Very disappointing stay at infinity 8. Staff were so slow and could not understand English. Food at the restaurant was below standard. They did not have much in stock. When we ordered from menu, the staff member kept coming back to say they did not have that dish. I was extremely shocked to see my body covered with big rashes the next morning. The bed bugs bit me all over my body. I was so itch and in pain from scratching. I should have taken photos and uploaded for all guests to see. Unfortunately, when coming back home the doctor put me on medication but I still have marks all over. When I complained to reception staff, the girls did not seem to care. I then asked for the manager who said I will look into whether others have complained. Not once did the general manager apologize or show much concern. He just walked away. I would not recommend people to stay here. Only good thing was the pool which closed too early every night anyway. This place is not worth your money or time. Good value for money if you want stay short. Its like premir economy class small room but valuable comfort beds. Nice breakfast if you go in the early time otherwise bit dry. Nice desk staff very helpful everything I asked was assist well. Nice location to uluwatu and up to ubud covering 1-2hours by motorbike. Hire motorbike is very good price. Hotel and staff are very good (western style). The facilities are very recent with a swimming pool at the rooftop. The location is a bit outside of Jimbaran. It’s located in the main Road to the south of Bali. You need a car or a scooter to go to the beach. I have been the Bali 4 times and this is the best hotel accomodation that I had so far. The stuffs were super friendly and helpful as they aid in preparing a surprise birthday design in my room for my partner. Everything turned out great and we really enjoyed our time there. The rooftop infinity pool is really nice for photography. Gym facility is great. Hotel rented us motorbike so that I can easily tour Bali by myself during my stay. And it was cheap as well, 75000rp/day. I am really satisfied with my stay and I hope to return again someday. Meanwhile, i will definitely recommend my friends to stay here. Worth the $$ 100%%%. Thank you to the lovely stuffs of infinity8 for the excellent service. You guys are amazing!!! Loved the facilities. The staff was professional concerning everything. They should re-think their options when it comes to breakfast. You are catering to different people from around the world. The breakfast should not be strictly Indonesian. This was a downside for me. The location isn't the best. There is nothing around. You will have to rent a motorbike. Nice swimming pool which was on their roof top, their roof top bar was nice too. Bathroom and bedroom amenities were sufficient for a comfortable stay and they catered to our request of connecting rooms too which was nice. TV pictures were not so clear. Though it was a short stay, we all enjoyed our stay. Very Happy and satisfied when i stayed in this hotel. The room is Very clean and tidy, everything in the room is new, the lightning is good too, not to dark. The Bed is good, the other facilities is good. This hotel is incredible for the price you pay. The gym, pool, breakfast and rooms are very nice. The staff is friendly. The disadvantage is that it is used by Chinese tour groups, so it can be very busy at breakfast in the morning. The other issue is that the hotel doesn’t seem to be able to control who is smoking in their rooms (not allowed I believe). One of our neighbors smoked inside, and our room smelled very bad. The location is not great, but there are some restaurants down the street and they rent out motorbikes so you can get everywhere. We utilised the Hotel pick up service since we arrived quite late and night and didnt want to bother getting a taxi. The ride was nice and quick (no traffic) and overall we enjoyed our stay! GWK national park was close to the area to visit for our very first day and we loved it! Amenities are great and we enjoyed the food for breaky! We got a 50% off deal so it was good value for money but if we were to have paid full price I would of been disappointed. The taxi service they provide is far too overpriced. They said they have scooters available but all 3 times we attempted to hire one they were all booked out. That is understandable but they would not help us to find a scooter from another company as they wanted more money from us to pay for their drivers. The breakfast buffet which was not included so we paid extra for one morning was not very good and I wouldn’t recommend it. But staff were friendly, the rooms were very clean and the roof top pool was nice. Amazing view from the swimming pool, we love it . Good for the kids. But you need a car to get there. It’s a good hotel anyway ! Very new hotel. Food was great. Very clean and modern hotel. The suite room was the best! Pool was nice. Staff were really accommodating. I recommend it to all types of travellers who wants comfort in a reasonable price. The location was also a plus! Clean and nice hotel with swimming pool on the rooftop and with gym. Clean swimming pool. Good room, we also rent bike for 75 per day, this good Honda Vario. Very friendly staff they help to rent grub for cheap price because crime Uber driver want 150-250 cash, but we have only Visa card. Finally we arrive to airport for 33k. Generally it was a nice stay in the room. It was clean and complete but the smell of the room especially the bathroom was really stinky. Early check in should not be charged too much specially for early check out cases.